Businesses cannot fail to have noticed the increasing numbers of workers using tablets; in fact IDC believes that tablet sales will overtake PC sales during the Christmas period of 2013, by 84.1 million to 83.1 million. Tablets tend to be lighter, faster, less clunky and more portable than laptops, so it's not surprising more and more people are buying them. But while tablets can be fantastic for consumers they can cause headaches for businesses as they are another device that needs to be supported and often run an operating system that is unfamiliar to IT. This means IT's policies governing applications, access and security are not implemented on the tablet and the closed nature of many of the leading tablets on the market make it difficult to get around that. That's where tablets running Windows come in. Windows is familiar territory for IT, a common platform already in use across the enterprise. The applications and settings used on PCs and managed via Active Directory and Group Policy can be replicated on a tablet running Windows 8, taking away the worry about productivity and security. Having a fully-formed PC running on a portable tablet is just what businesses need. For example the Dell Venue Pro 8 and Venue Pro 11 run the full desktop versions of Windows 8.1, meaning any application a business runs in its environment should be able to run on the tablets as well. This means Microsoft Office can run on a Windows tablet, which is hugely convenient for business users and a clear advantage for Windows tablets over the competition. 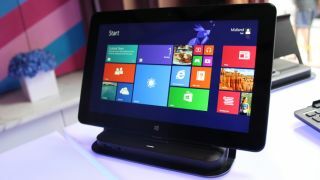 Even processor-heavy applications like PhotoShop will run on a Windows 8 tablet. Add in integrated support for Microsoft applications such as Outlook and SkyDrive and you have the perfect device to help workers get their job done when away from the office. What many enterprises really want when looking at tablets is the peace of mind that comes from knowing data on a device is as well protected as it would be in a desktop PC environment. That's why features such as TPM and Windows Bitlocker are so essential to the tablet experience; enabling IT to encrypt files or even entire drives means if the device is lost or stolen the sensitive data will not fall into the wrong hands. Dell's Venue Pro 11 also features Dell Data Protection and optional added security such as a fingerprint reader or smart card reader. Other features that you'd expect on a PC - multiple user accounts, multitasking and USB peripherals support such as an external hard drive - are included. Many Windows tablets come with a docking station, enabling users to hook the device up to a monitor and turn the tablet into a PC. That's perfect for workers who want a tablet when they're out and about but prefer working on a desktop computer when they're back in the office. There is no worry about transferring files from one device to the other, either. And all important data and settings will be there as well, because you'll be using the same device the whole time. A Windows tablet really is the best of both worlds for businesses and users. IT gets to support what is an extension of the familiar Windows environment and users have all the benefits of a tablet coupled with the benefits of Windows.